On Sunday afternoon, Attorney General William Barr released a 4-page letter, which he described as a summary "of the principal conclusions reached by Special Counsel Robert S. Mueller III." Barr's letter includes very little from Mueller's actual report -- just 65 words and not a single complete sentence. Trump quickly celebrated the letter as an unambiguous victory. "No Collusion, No Obstruction, Complete and Total EXONERATION," Trump tweeted. You'll be shocked to learn that Trump’s tweet is not accurate. The Mueller report, according to Barr's letter, explicitly states it "does not exonerate" Trump. Barr quotes this partial line from the Mueller report: "[T]he investigation did not establish that members of the Trump Campaign conspired or coordinated with the Russian government in its election interference activities." This will disappoint those that expected the Mueller investigation to end with Trump being frog-marched out of the White House for being a Russian spy. But it does not mean that Mueller did not uncover misconduct by the Trump campaign related to the Russian interference activities. As Renato Mariotti, a former federal prosecutor, explained, "at times I declined cases where there was a lot of evidence that appeared very troubling, simply because I lacked sufficient evidence to prove a key element beyond a reasonable doubt." Mueller concluded that those facts and whatever else he found were not enough to establish the Trump campaign conspired with Russia beyond a reasonable doubt. What else did Mueller find that has not been made public? We don't know because his report has not been released and the Barr letter does not discuss it. According to Barr's letter, the scope of the conspiracy investigation was somewhat limited. Barr writes that Mueller determined no one from the Trump campaign: 1. conspired with the Russian Internet Research Agency in executing a social media disinformation campaign, or 2. conspired with the Russian government to hack and distribute Democratic emails. This scope does not appear to include potential "quid pro quo" conspiracies that do not involve direct collaboration on internet trolling or hacking. For example, Natalia Veselnitskaya, the Kremlin-connected lawyer who attended the meeting at Trump Tower with top campaign officials, said Trump Jr. promised her his father would reconsider the Magnitsky Act "if we come to power." Mueller's report may explain and justify the scope of his investigation in great detail. We don't know because the report has not been released. According to the Barr letter, Mueller uncovered evidence that he believed could reasonably support a criminal obstruction of justice charge against Trump. This includes evidence that is not public. For reasons that are not explained, however, Mueller declined to make a recommendation either way. "[W]hile this report does not conclude that the President committed a crime, it also does not exonerate him," Mueller writes, according to Barr. Barr claims that since Mueller didn't make a determination about the evidence, Mueller "leaves it to the Attorney General to determine whether the conduct described in the report constitutes a crime." This is a dubious conclusion since DOJ policy prohibits the criminal indictment of a sitting president. It seems more likely that Mueller believed that, in light of DOJ policy, it was more important to present the facts to Congress so it could consider impeachment. Mueller, after all, was FBI Director for more than a decade and served as Acting Deputy Attorney General. He is just as capable as Barr is to decide what constitutes a crime. Nevertheless, after less than 48-hours of reviewing Mueller’s report, Barr asserts that Trump did not commit a crime. "I have concluded that the evidence developed during the Special Counsel's investigation is not sufficient to establish that the President committed an obstruction-of-justice offense," Barr writes. Barr also flatly states, without explanation or interviewing Trump, that none of Trump's actions cataloged by Mueller were done with "corrupt intent," an element of obstruction of justice. Mueller did not reach such a conclusion because, if he did, his investigation would have exonerated Trump. Mueller was not consulted on the contents of the letter. Jeff Sessions was ousted as Attorney General because Trump was unhappy that Sessions recused himself from the Russia investigation. This isn't a conspiracy theory. On May 30, 2018, Trump tweeted that Sessions should have told him he would not participate in the Russia investigation so he could have picked someone else. On August 1, 2018, he demanded that Sessions end the Mueller investigation immediately. Sessions did not these instructions and Trump sacked Sessions immediately after the midterm election. 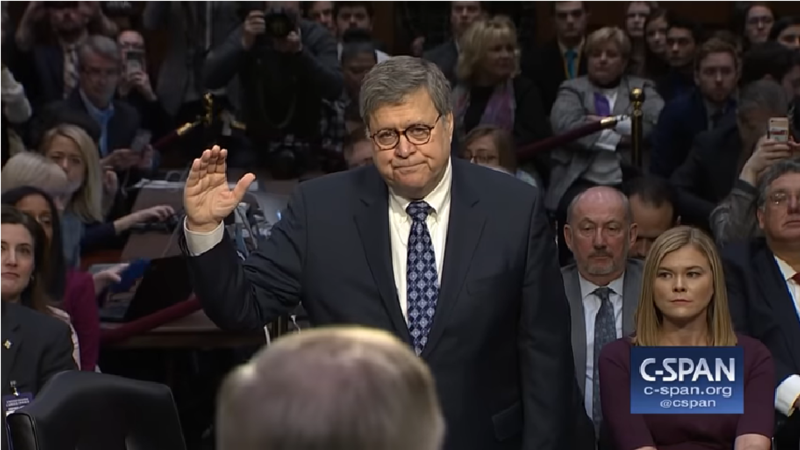 Trump eventually selected Barr to replace Sessions as Attorney General. Barr's snap decision to declare Trump innocent of obstruction of justice should not be a surprise. Barr sent an unsolicited memo to the Justice Department last June "that excoriated special counsel Robert Mueller’s inquiry into potential obstruction of justice by Mr. Trump, saying it is based on a 'fatally misconceived' theory that would cause lasting damage to the presidency and the executive branch." Barr argued that Mueller's obstruction of justice investigation was based on a "novel and legally insupportable reading of the law." According to Barr, "the obstruction of justice statute does not apply to the president because the text of the statute doesn’t specifically mention the president." Less than six months later, Trump nominated him to become Attorney General and oversee the Mueller investigation. Barr was confirmed by the Senate on February 14. Yesterday, he effectively dismissed Mueller's report and declared Trump did not obstruct justice. Barr says he will release more of the report after he redacts information that is sourced from grand jury proceedings, which he says must remain secret. In Watergate, the special counsel transmitted the full report, which included grand jury material, to Congress by obtaining approval from the federal judge overseeing the case. Further, the portion of the report concerning obstruction of justice reportedly does not include any grand jury information because none of those witnesses appeared before the grand jury. Speaker Nancy Pelosi (D-CA) and Senator Chuck Schumer (D-NY) are demanding "the full report and the underlying documents." Congressman Jerry Nadler (D-NY), the chairman of the House Judiciary Committee, said he would subpoena Barr so he can be questioned on why he decided to exonerate the president when Mueller did not. Another option would be to subpoena Mueller to testify, although Democrats did not indicate they were prepared to do so.